Our block and paving stone cutting service is valuable if you have just a few cuts, and you measure carefully. We try to do our block cutting while you wait, but we can’t always guarantee it – if we’re really busy we may ask you to pick the cuts up later. Please call for current rates and for an estimate of how long you can expect to wait before the blocks are ready. We require that you mark your block(s) with a straight line, made with a permanent black marker. Please make sure to indicate which side(s) are scrap. We will cut directly on the line indicated, so measure very carefully! Please note: if your block does not fit we will have to charge another cutting fee to fine tune the fit for you. 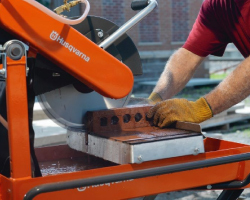 When you need five or more cuts it is usually more cost effective to simply rent a masonry saw from us. Having the saw on-site is the best way to achieve a tight-fit where fine-tuning can be done on a piece by piece basis. Looking to buy some blocks? Sharecost is proud to have some of the best selection of retaining wall blocks, paving stones, concrete slabs, and porcelain slabs available in Nanaimo. If you’re looking for a specific style or colour, chances are we have it. Refer to our Pavers & Blocks page for more details, or stop by and check out our display at the Project Desk.